When you’re in Page, Arizona, this is a side trip you shouldn’t miss. It is about a 10 minute drive from Page, just off highway 89. From the parking area, we hiked for about a 3/4 mile downhill on sandy and rocky surfaces. Throughout the hike all you can see is the vast expanse of the flat desert. The trail has some steep ups and downs and some deep sand. Even those in the worst of shape, though, can make it if you take your time. You’ll end up unexpectedly in a crater with dramatic views. From the rim of the canyon, you can see the beautiful Horseshoe bend. Horseshoe Bend is another of Mother Nature’s creation in a world of sandstone and slick rock, and one of the wonderful formations in the west. The cliffs are very steep with no guard rails, and it is a bit scary at the edge. Below is the Colorado river meandering around a huge sandstone bluff. As the river flows, it sparkles and shines in different shades of green and blue. 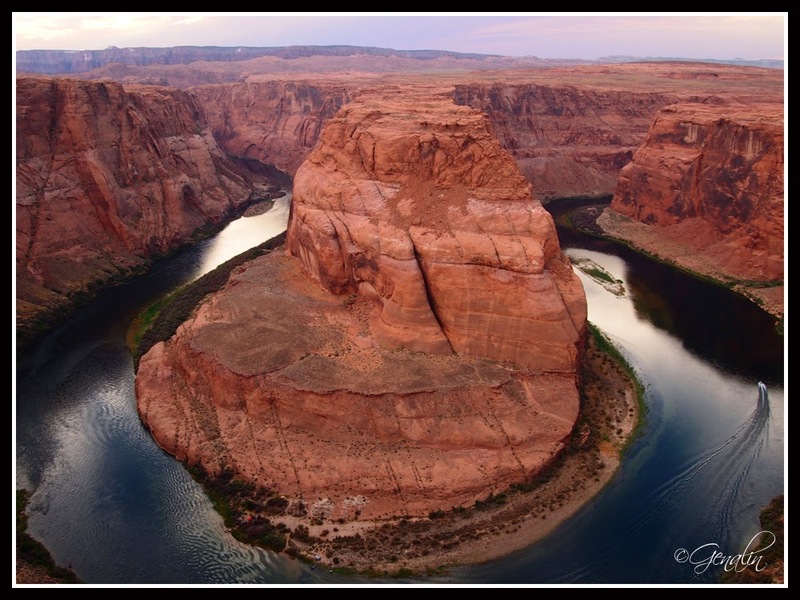 As the Colorado river cut through layers of red rock, the 270 degree horseshoe bend was formed.